In October, students from Johns Hopkins came to visit the ship and get some practice photographing different things. Howard Ehrenfeld, Instructor, Johns Hopkins Center for Visual Arts brought his students to the ship while the house and bridge were being painted, saying that he thought the ship would be an interesting venue to practice their skills. Once they arrived, they received a safety talk and some history of the ship and then were able to go around and shoot pictures. Some of the students have sent their thoughts and a few of their pictures, so enjoy looking at the ship from a very different perspective. When I asked the woman giving us a tour what her favorite feature was, she said she liked the little details. Sometimes you can get overwhelmed with all of the stuff on the boat, but when you visit it enough, you notice small details such as the rust and pealing paint. Another thing that was very present on the ship was rope. I found this very interesting because there were many fine details that could be focused on when shooting them. On the deck there were a lot of tall columns and wires. These sort of distort the view of the picture because the vertical lines make the objects seem taller than they were and I liked this optical effect. I created this HDR picture of the door leading out to the deck because there was a lot going on that I wanted to capture. The inside of the boat is so simple in comparison to the deck and I think this picture captures that. Yay, I caught Raven (fellow classmate) looking out at sea! Again in this picture, I made sure that the sky was nice and blue, but I also paid attention to the imagery of the ropes. I liked the texture of the ropes and how sharp they were. I also liked the perspective of the image and how it looks like a bunch of odd creatures trying to abandon ship. I'm not exactly sure why I like this photo, but I do. I think maybe it's that the yellow contrasts so much with the background, but stays part of the theme of the picture because of the griminess that is present on top of the yellow and on top of the gray paint. The order and texture in this picture are important to me. The rust on the bolts compared to their orderly arrangement is interesting to me. I liked how they were in a perfect line. I also like the earthy colors. While maybe not the best photo technically, I thought the subject was funny. I see a face with two eyes (the two bolts), and a mouth drinking out of a straw (the pip leading the bottom of the pentagon shape). I liked this photo because it is an introduction to the slightly run down vibe that I focused on for most of my photos. The rust on the chains came out well when I upped my blacks a little and the background was a challenge because I wasn't sure how bright to because so that it wouldn't distract from the chain links. ___Life Preserver. This was one of my first shots from our visit to the John W Brown. 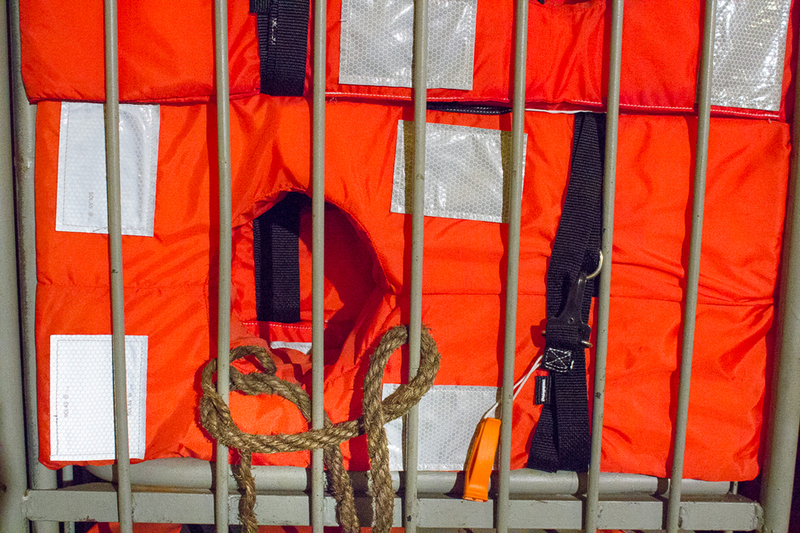 The patterns created by the rope netting created an interesting textured background for the life preserver. ___Flag. This shot was tricky since I had to time it properly to get the wind unfurling the flag, and balance the light reflecting off the water as well. ___Rope. I really like this photo because you can see the detail of the rope and the wooden pulley. 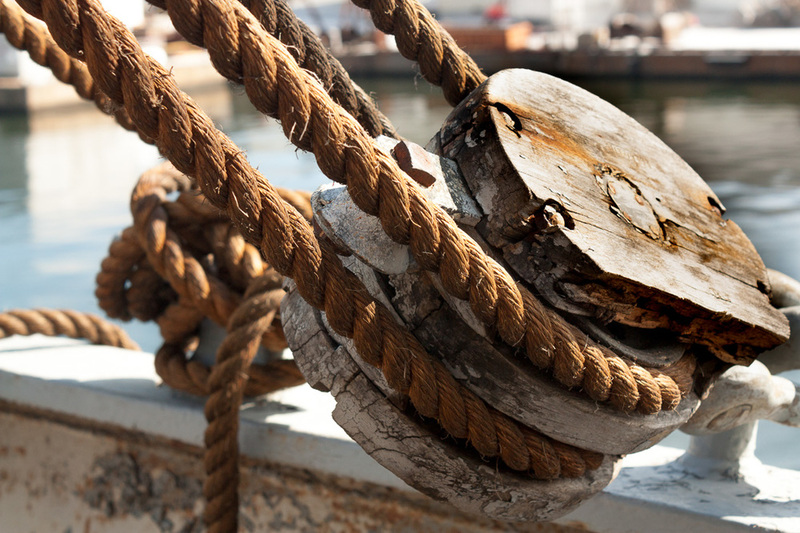 There were lots of different ropes around the deck and I enjoyed trying to capture the detail and textures of them. ___Life vest. I also really liked the large crates of life vests below deck. The patterns of the bars combined with the bright color of the vests made a great shot. ___Engine. And finally, the engine room was really interesting. However, I had a hard time getting the camera to focus for most of my shots on the tripod in the dark conditions. These photographs from these 3 students really show the textures and colors and details that you find on the BROWN and many historic ships. In photography, there are always debates over what is the best gear, or the most interesting genre. But in reality, the best camera is the one that you have on you at any time (which could be a cell phone, a point and shoot or a $4,000 camera. It does not matter). What really matters is the eye of the photographer, and the ideas, thoughts, life experiences that are reflected in those eyes. We find these shots very cool because the students came with no knowledge or preconceived ideas, and were able to wander around and shoot what interested them.